Friday evening December 5th, the Wayne Art Center located on Philadelphia’s prestigious Main Line will host a Gala Preview event and opening for the 20th anniversary of the Craft Forms 2014 international juried exhibition. I am thrilled to be one of the chosen artists to show my metalwork. This year’s exhibit will showcase the artwork of ninety-nine artists selected from over four hundred applicants worldwide. Jurors David R. McFadden, Chief Curator Emeritus of the Museum of Arts and Design, New York City, NY and Bruce W. Pepich, Executive Director and Curator of Collections of the Racine Art Museum, Racine, WI selected the works to be on display in the Davenport Gallery at Wayne Art Center. My Widget Locket #5: Homage to Vanity will be on display alongside the work of such notable metalsmiths and jewelers, such as Helen Shirk (California), Marjorie Simon (Pennsylvania), Teresa Faris (Wisconsin), Ana M. Lopez (Texas), Jennifer Crupi (New Jersey) and Sandra Enterline (California) among several others. Additionally, other craft genres will be well-represented, such as artists working in clay, fiber, glass, wood and 3-D printing. I am quite anxious to see the work of all of these stellar artists in-person and in this case, only a short drive from home. 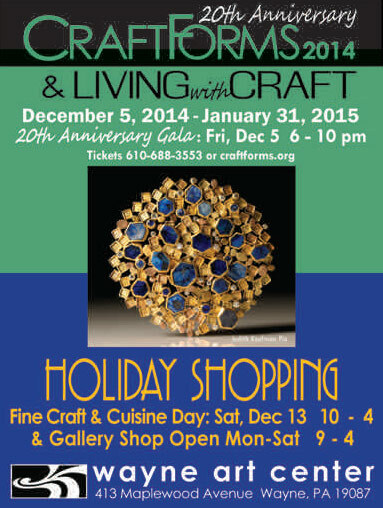 Craft Forms 20th Juried Exhibition ad. Pictured: “Pin”, Judith Kaufman, 3.5″ x 3.5″ x .5″. Image courtesy of Wayne Art Center, PA. If you live near the Main Line suburbs of Philadelphia, Pennsylvania or have plans to travel to suburban Philadelphia for the upcoming holidays, I would encourage anyone to stop by the Wayne Art Center galleries and see this exhibit in-person. The gallery will host a 20th Anniversary Gala Opening from 6 – 10 PM on Friday, December 5th (call 610-688-3553 for tickets) with juror awards announced that evening. Craft Forms runs through January 31st, 2015 at The Davenport Gallery, located inside the Wayne Art Center at 413 Maplewood Avenue in Wayne, Pennsylvania. Patricia I am so excited for you! Congratulations on getting accepted into this show and really I am not surprised… your work is excellent. I wish I was coming back to Philly for Xmas but I’m not, unfortunately. I would definitely go to see your show. My brother lives on the Main Line and I will let him know… Thanks for your kind comments on my blog… and great to see you back! Anita, what a really kind and generous remark!! I genuinely appreciate it, and I hope we can meet up one day soon at either of our respective showings. What a wonderful coincidence that you have family on the Main Line. It’s such a fabulous and vibrant part of the Philly suburbs. Thank you so much for thinking of me and popping by to comment. I ADORE your latest genre of work, by the way!! Congratulations, Patricia!!! You’ve truly been making the rounds this year and it’s wonderful to be able to follow some of your exhibitions via the interwebs. I am, of course, particularly excited about this one in particular as it is local. You can be sure that I will pay a visit to the Wayne Gallery while your work is on display. Gina, thank you so much! I’m also glad that one of the shows I’m participating in is such a short distance away! The two jurors really chose such an outstanding roster of artists, so I think you’ll really enjoy seeing this exhibit. (Also, the galleries inside the WAC are truly gorgeous!) P.S. Mom’s side of my family is from Italy, so AUGURI!! Happy holidays!! Mandy!! Thanks for your lovely compliments – I feel so fortunate to be able to show my work among such great company (of all different types of media.) Thanks for stopping by today! I so much wish I lived (or at least travelled) in your part of the world and could come and see it! I completely understand how you feel, Gunilla – I’d LOVE to visit and explore the contemporary jewelry scene that’s thriving in the Netherlands lately. May international travels be ‘in the cards’ for both of us in the relatively near-future! Thanks for your visit and wonderful comments!! That is exciting news to be one of the chosen artists! Congratulations and I wish you all the best!! Thanks andrée!! I appreciate your visit and kind comments! Patricia, congratulations on having your work selected (again!). You’ve been so busy this year, you’re amazing. This is indeed a prestigious show for crafts. My visit to the website, and the small sampling of work I saw made me wish I could go there and experience it in person. Alas! I see there is a show of works by students as well. It’s good that the Wayne Centre is reaching out to inspire the next generation of craftspeople. Oh, and that Preview Party sounds exciting. Have fun, Patricia! Dominique – what truly generous and lovely comments you’ve shared w/ me today! Thank you! Yes, in addition to the showing of abstract paintings by students at WAC, there’s another companion exhibit that is invitational, called “Living With Craft” that I’m anxious to see. I’m hoping since this exhibit is close to my area – I’m able to return and look through all the galleries more than just once before it comes down c. 1/31/15. I also want to share that WordPress just told me that your ‘Like’ on this post is artdoesmatter’s 1,000 like!! How wonderful is that it is YOU!! I’m so happy you stopped by today, Dominique! Thanks again! Ninety nine artists, wow, very well done that lady. I would feel myself very well blessed to see, let alone be included in such a line up. The 3d printing is interesting. Not too sure how to receive this new tour de force. Not enough experience, so wait for the inevitable flood that is sure to come. Fantastic to see you still wedded to the personal, tactile and slow craft route. Smashing and heartening to see, thank you for sharing. Very best wishes. Stu, you always say the most honest and well-spoken remarks!! I will have to agree that the 3-D printing as its own category is a huge new development – as Temple University in Philadelphia here has one of the largest, most “cutting-edge” jewelry departments that’s almost exclusively dedicated to the 3-D printing aspect of jewelry design. I think b/c I previously attended Temple (graduating in a diff. dept. although) I may be slightly biased as an advocate of what these graduates/makers are creating! You phrase this new dilemma amongst jewelers so well when you state you’re not sure how to receive this new tour de force!! Once again, TY so much for stopping by and sharing such insightful feedback w/ me this evening! Thanks so much, Sharon – and good luck w/ your event this weekend, too! Congratulations on being selected for this show. I hope it does well for you. Thanks, Al! I appreciate you stopping by today and hope you’re doing well.